Roam across miles of African savannah past Kudu, Zebra, Giraffe and more when you head out on a quad biking safari in Limpopo. 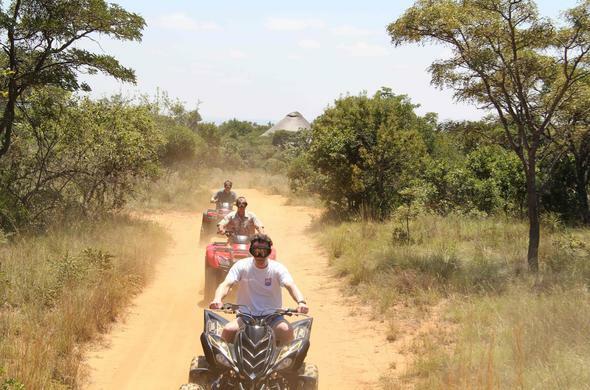 A quad biking safari through the wilderness is an ingenious way to explore the African bush. Low to the ground, easy to manoeuvre, safe to drive and fairly light weight, an ATV or quad biking safari is popular tourist attraction for visitors of all ages.Even if you are not the type of traveller who is keen to experience extreme adventure activities, if you have a sense of adventure then a quad biking safari is for you. Ranging from 1 to 4 hours in length, or even sometimes overnight, quad biking safaris are usually done in groups of between 4 - 20 people and are always lead by highly skilled and enthusiastic guides who are there to ensure your safety and to answer any questions you may have along the way.Suitable to be driven by anyone over the age of 16, quad bikes are easy to drive. Tailor-made to suit your level or experience and your comfort on the bikes, quad biking safaris are a fun adventure activity for families with teenage children.Once your guide has explained how the quad bike works and you have had the chance to get used to changing the gears of the 250cc bike below you, it is time to head out. Driving into the African wilderness you navigate through different landscapes, taking in the sights and sounds around you and stopping occasionally to watch the wildlife around you or to simply take in the beauty of your immediate surroundings.While it may be exhilarating to race each other and to try to do jumps and 'donuts' the emphasis of a quad biking safari is to view game, and soon you will find yourself driving near to a herd of Elephant or a Buffalo and the urge to go faster will have evaporated completely as you will suddenly realise that you are truly in the middle of the bush with the animals. A quad biking safari allows you to get really close to the wildlife as they view you are being another mammal just like them!